The Southern Movement [SM] has changed the face of southern provinces of Yemen since it emerged in 2007. The movement was formed due to suppression and intimidation by the former President Ali Abdullah Saleh. The movement chose peaceful struggle over military action despite calls for use of force by some groups that were formed outside Yemen following the 1994 summer war. It adopted the peaceful manner to resist elimination of southern military personnel and civil servants from the service that ensued from the victory of Saleh's forces against his deputy then, Ali Salem Al-Baid who declared separation of south Yemen from the north. The SM participated effectively in the peaceful revolution against Saleh that broke out in February 2011 within the Arab spring till the GCC initiative brought the first southern President, Abd Rabo Mansour Hadi to the office, ruling the country from Sanaá. However, Saleh in a revenge for exit from the office, managed to turn southern provinces into an open ground for expansion of terror groups. When the capital Sanaá fell into the hands of the Houthis, Aden was already a fertile place for Saleh to retaliate from his successor. Three proposals appeared in south Yemen following the intervention of the Arab Coalition that played a key role in the liberation of southern provinces. These three proposals are conflicting. And some of them were influenced by the Houthis' armed struggle. Some of these proposals watch carefully for the interests of the GCC nations and another one seeking a state that could achieve goodness for everyone. 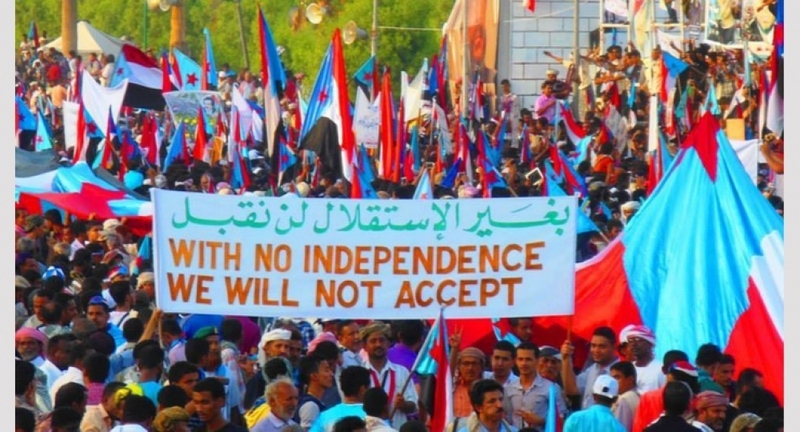 The gradually separation proposal, led by Aidaroos Al-Zabeedi that was well expressed in the so-called Aden Historical Statement, believes that its time to begin steps of the southern state retrieving by forming a ruling political council. However, this proposal conflicts with other proposal such as Hadramout independence vision, the GCC vision for the national security and the federal state proposal that is led by President Hadi. The autonomy proposal for Hadramout has much to stand better than the first one because Hadramout has points of strengths including economic resources and coexistence among entities of the Hadrami society. Nevertheless, there are impediments for this proposal to be materialized. These obstructions represented mainly in that autonomy or independence is similar to separation. It also requires true situation analysis for the situation of Yemen and the GCC vision for the gulf national security. It also contradicts outcomes of the National Dialogue Conference [NDC] that set Hadramout as a region composed of other governorates. The formation of an independent army for Hadramout as it was outlined in the Hadramout Conference Statement is deemed to be an independence from the Yemeni state. The third proposal is the federal state that is led by President Abd Rabo Mansour Hadi. This proposal is to implement outcomes of the NDC to establish a federal state of a number of regions with broad authority on economic and development decision-making. This study recommends the SM to reorganize priorities of the present phase where securing services for citizens, ending the coup and maintaining national security for the region come first. It also urges the Arab Coalition to adopt a unified approach in south Yemen to save it from looming civil war and taking a strategy that prevents access of Iran into Yemen as well supporting integration of all armed factions into the national army. It calls on the legitimate government to speed up economic development and activate state offices in complete coordination with the Arab Coalition.